Perhaps you saw our recent tweet showing students holding a large bound volume of aerial photographs? This volume was one of two that were included in a recent batch of items digitized for the Stanly County Museum. Other items in this batch include a group of indentures from 1795 – 1886. These are some of the oldest items on our site. Common surnames in the indentures include Blackwelder, Ridenhour, and Lyerly. The final two items from this batch are the Stanly County North Carolina Common School Register (1838-1863) and the Albemarle School District Census (1906). The latter includes students’ names, ages, and whether they were male or female, and what we believe are parents’ names. 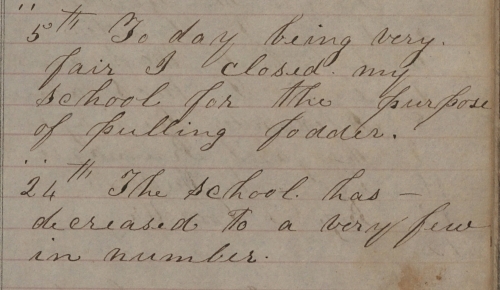 The former includes a bit more detail, including attendance records, grades, and the occupations of parents. Down the right hand pages are notes from the teacher that are a diary of sorts, describing school activities, visitors, the weather, as well as an expulsion and several deaths. Also, be sure to take a look at the school rules, enumerated on page 7. No whooping or hallowing! View all of the materials on DigitalNC from the Stanly County Museum.